I have been feeling a bit under the weather as the season is in the clumsy process of changing over. You know, 85 degrees and sunny one day, 61 and blustery the next! Any hoo, I made a super simple and satisfying soup to help me get back in the swing of things, and I had to share. My favorite part of this soup? The bulk of it, the quinoa and beans, I had prepared in advance—so this quick and easy lunch pretty much put itself together. My second favorite part of this soup? Sea Weeds: kombu and wakame to be precise. Both of which are great sources of calcium, manganese, iodine (supports thyroid function), thiamine and niacin. Sea weeds are great for blood purification, intestinal strength, skin, and hair. Kombu is a great addition to beans as well, because it has an enzyme that breaks down the gas producing qualities of beans. Just sayin’. Sweet Potatoes:What power houses! Sweet potatoes are loaded with Vitamin B6-great for the heart; are a great source of vitamin C-which help your immune system, not to mention your skin, digestion, and managing stress level. Sweet potatoes contain vitamin D, which is great for the upcoming winter months, as well as taming our moods, boosting energy levels, and building health…generally. Plus a whole lot more, I won’t even get into the high level of magnesium, the relaxation mineral; or Iron, the immunity booster. Ginger: Great for the digestion, cramps, or nausea. Ginger also helps to clear the microcirculatory channels of the body (which include the sinuses) great to aid the body in releasing pesky germs. Ginger also helps the body take in essential nutrients, which you are getting a lot of from the rest of the ingredients in this soup! Score! My quinoa and beans were already cooked, which made things super simple. You could of course cook them at the same time if necessary. Also feel free to use brown rice if you have that kicking around. The Adzuki beans don’t need to be soaked and cook in about 45 min. Canned beans would work too. Sauté ginger and garlic in olive oil until aromatic. Add the chopped celery, peppers, and sweet potato. Sauté lightly, with a bit of salt for 5 minutes or so. Next, add two quarts water and a 1inch thick strip of kombu to the pot. Bring to a light boil, then turn to medium heat and cook until potatoes are tender, about 30 min. Once potatoes have softened, add another pinch of sea salt to taste and add the chopped kale. You can now turn off the heat and cover, allowing the kale to just wilt. 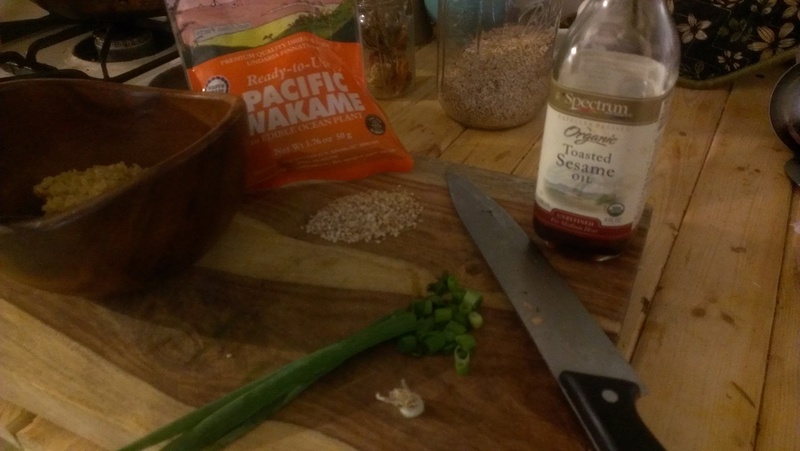 In your serving bowl, add 1/2 cup cooked quinoa, 1/2 cup cooked adzuki beans, chopped scallions and sesame seeds. Add the soup on top, swirl in about 3/4 t of sesame oil, and a pinch of wakame seaweed. Super simple, so warming, and very satisfying. To good health, and Bob Dylan!